I seem to have unintentionally started some kind of C word title trend. 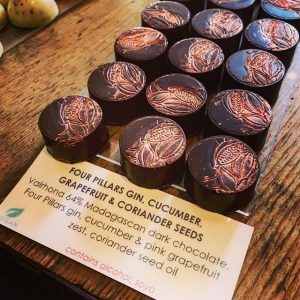 Last month I spoke about Canned Clients, Cups and Calabria; this month I want to tell you all about a Chocolate Tour of Mayfair, attending Pirate Summit in Cologne and my magical experience at La Salle, a 16th Century French Castle. The cosy corner, heady hot chocolate and artistic decor of glowing neon signs made the start of this Saturday morning tour quite surreal and it was with blinking eyes and a sense of new adventure that we appeared into the sunny street, ready to head to our first chocolate shop. Click here for full blog. Having been involved in startup events for the best part of 5 years, I have a real respect for those running bigger yet still for the community style events. Pirate Summit really grabbed my attention because of it’s fun name, the fact I recognised a few faces in photos on their website and because I’d never been to Cologne before 🙂 Now, before I start picking the event apart I must remind you I’m an events manager and therefore a harsh critic! First up one of my biggest pet peeves is bad first impressions. Too often people planning events think to avoid this you need great decor, smiling faces and swag loaded goodie bags but no, it means get registration right! 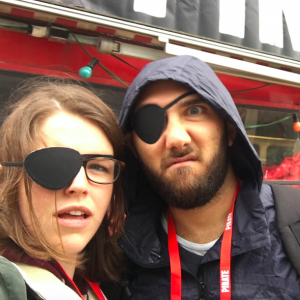 Unfortunately these pirates hadn’t got it quite right and arriving at presumably peak time they had no more than three staff at the gate and we had to wait for a good 15 mins in the cold drizzle to get a lanyard and an eye patch. The venue was pretty cool – Odonien is a scrap yard come event space… if you can imagine rusty, fire breathing robotic dragons then you get the picture. As the weather wasn’t great it quite quickly turned from “oooh ahhh” to “erm, is that bit of corrugated roof properly tied down because it’s getting a bit windy”. However the place really came into it’s own at night when sunlight (or some distant cousin of sunlight) departed and let designed spot lighting and fire, highlight the exciting and creative aspects. There was a ompah band, a burning effigy and free beer so needless to say that’s when the party really started. I just checked their website and see that perhaps the Pirates felt it too… they are reimagining Pirate Summit and will announce changes soon! 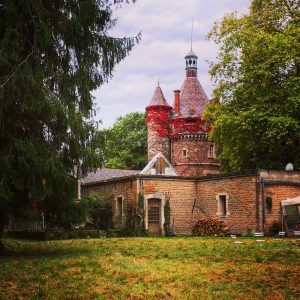 My final days of September were spent visiting the enchanting Chateau de La Salle, a 16th Century French castle and large estate. Jess, a friend I first met in London’s Google Campus, decided to get out of the rat race and set herself the mammoth challenge of rescuing her family’s chateau, boarded up sixteen years earlier. The furniture had all been removed after a family feud and nature in the form of thick ivy was doing her best to creep in, taking glass windows down and bringing in with her the damp. 80+ artists, wellness specialists, poets, festival goers, bloggers and entrepreneurs decended on this peaceful haven and enjoyed a wealth of activities. My first night there was especially magical as only half the group had arrived by then and we enjoyed a very intimate, silent dining experience followed by a cosy fireside chat style talk about pluralism and the professional polymath. Over the weekend we tried our hand at archery, stick fighting, pasta making, yoga and making pizza the traditional way in a woodburning oven. We ate together and everyone was responsible for washing their own dishes. There were banquettes, a silent disco, a film night and a bonfire. There were talks on leadership, being a fruitarian and imaginative digital marketing; we heard from the Events Manager for Wilderness festival and saw a documentary one of the guests had made about singer castes in India. If ever I needed nourishment for mind body and soul, it was here that I found it. Jess and her new co-founders have committed to a 25 year plan to open up La Salle’s magnificent doors to a community of creators and with the revenue and personal contributions (gardening anyone?) we can all help bring La Salle back to life. Every day since leaving, I have thought about this amazing place and how I can create experiences that help welcome more people. If you want to collaborate on something with me next year, please get in touch.